Just days after Canada lost poet, novelist and painter P.K. Page at 93, Kate McGarrigle has left us at the far too young age of 63. Mother of Rufus and Martha Wainwright (she used to be married to American folksinger Loudon Wainwright III), Kate is best known as half of Quebec’s beloved folk duo, the McGarrigle Sisters. Kate and Anna McGarrigle are folk and roots music legends; true Canadian icons (not like Celine Dion or Nickelback, god forbid, but in the manner of Leonard Cohen and Joni Mitchell, and, dare I say it, Pierre Trudeau). For three decades they weaved a simple, understated magic with their harmonies and original songs, which have been covered by the likes of Emmylou Harris, Linda Ronstadt, Maria Muldaur and Kirsty MacColl. Kate died at her home Monday in Montreal after fighting sarcoma, a rare form of cancer, since 2006. Count me among the broken-hearted. Love Over and Over (from the early ’80s album of the same name) has always been one of my absolute favourite songs, its catchy baby baby baby ’til my tongue spirals outta my head … riff impossible to get out of your own head once it’s gleefully inside. One of my top two Edmonton Folk Music Festival workshops (the other being Buffy Sainte-Marie rockin’ out with Mary Gauthier) featured Kate and Anna on Stage 6 with Tom Russell, Nanci Griffith and Greg Brown. Songwriters’ songwriters, every one of them. The afterglow lasted for days. The unglamourous McGarrigle sisters sang of joy, of sorrow, of driving cab for the Star Cab Company and of eating dinner at the kitchen table. They sang jaunty folksongs in French and English. They sang love is a shiny car / love is a steel guitar / love is the pleasures untold / and for some love is still a band of gold. I’ll allow that, like Iris Dement, they were a bit of an acquired taste. And just as there are many Canadians out there who have never heard of the remarkable P.K. 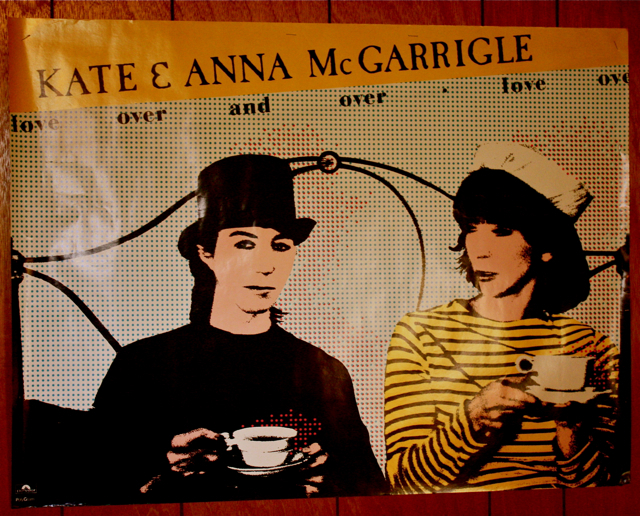 Page, there are many who will claim to have never heard of Kate & Anna McGarrigle. To them I say, you may not have heard of them, but you’ve definitely heard them. To me, Kate and Anna McGarrigle represented the best parts of a Canada that doesn’t exist anymore. A Canada that is polite and proud of it, eclectic, a bit fearless, a bit naive, and still (thankfully) a little untamed; a fair and caring nation, heartbeats accelerating. I would like to have it back. This entry was posted in art/write, Secrets and tagged kate and anna mcgarrigle, log driver's waltz, p.k. page. Bookmark the permalink. hello. i stumbled across your blog and noticed this post. i had only just discvoered the McGarrigle sisters when Kate passed away. thank you for giving them the respectful nod. i’m off to hunt for your book as well. happy writing. thanks. i hope you enjoy the book.